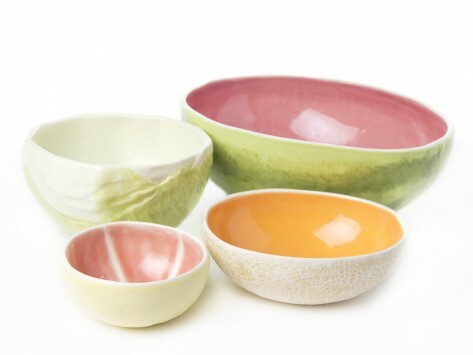 Ceramic bowls made from slip-cast molds of real fruits and vegetables. Complete Set of 4 includes 1 grapefruit, 1 cantaloupe, 1 green cabbage, and 1 watermelon. Dimensions: Grapefruit: 1.75" x 4.25" diameter; Cantaloupe: 6" x 5" x 2.25"; Green Cabbage: 3.5" x 6" diameter; Watermelon: 9.5" x 7.5" x 4"
These are just gorgeous and are so much fun! I have ordered a couple of sets to hold on to as totally unique Christmas presents. I got all 4. These are so beautiful! The size of each bowl mimics the fruit/veg that they depict. I love them! Most artwork is meant to be viewed, not filled with food. But a Vegetabowl isn’t like most artwork. It’s meant to be touched, filled, eaten out of, and enjoyed -- and it’s designed to stand up to the handling. The creator is Melanie Mckenney, who made her first fruit-shaped bowl while teaching a ceramics class about slip-casting and plaster mold-making. 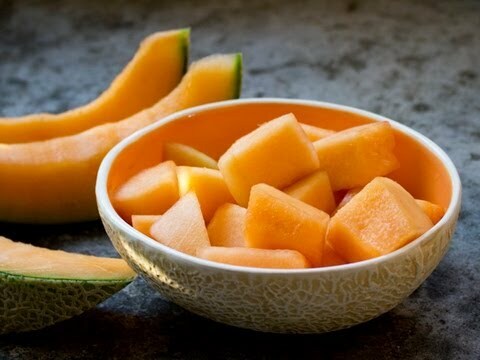 Melanie wanted to demonstrate the level of detail you can achieve, and she chose a cantaloupe for its unique texture. When her husband Justin, a glassblower, saw the demo bowl, he encouraged Melanie to make more, and the duo wound up in business together. Melanie and Justin’s earthenware bowls are slip-casted from molds they make using real fruits and vegetables, then painted to look as realistic as possible. It’s a very hands-on, time-consuming process to get the shape, color and texture just right. Vegetabowls are captivating on their own, but we think they’re even more impressive in action. What better container for eating grapefruit than a playful grapefruit Vegetabowl? A fruit salad seems destined for the uncannily realistic cantaloupe Vegetabowl, and the quirky cabbage Vegetabowl is a no-brainer for coleslaw and salads. Vegetabowls can hold hot and cold beverages, and they’re safe for the dishwasher. With art like this, we’ll never forget our fruits and veggies.